The UK's Institution of Mechanical Engineers has announced that liquid air can be used to store excess energy generated from renewable sources. For example, wind farms generate power at night, but since demand is low at that time, the energy may be wasted. When demand increases the next day, the liquid air can be warmed to drive a turbine, thereby giving the energy back. Engineers say the process can achieve an efficiency of up to 70%. when demand for power rises, the liquid is warmed to ambient temperature. As it vaporizes, it drives a turbine to produce electricity - no combustion is involved. Highview believes that, produced at scale, their kits could be up to 70% efficient, and IMechE agrees this figure is realistic. This work derives from the work of Britain’s Peter Dearman, who invented a liquid air engine to power vehicles as seen in the following video. Science fiction fans of yesteryear would not find this idea hard to believe. 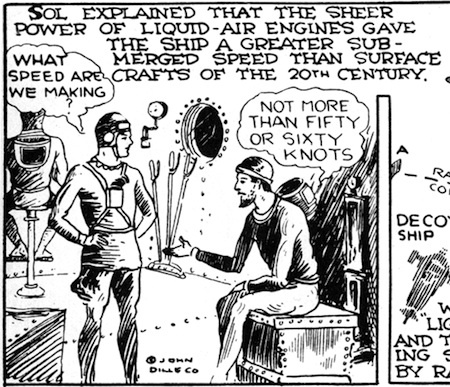 The idea of storing energy in liquid air and then using it to power engines was used in Buck Rogers in the 25th Century. Via BBC. Thanks to Winchell Chung of Project Rho for the tip and the reference on this story.